I'm so super excited to take a break from all the PCS talk and bring you guys something fun today! 2 weeks ago my beautiful neighbor, Kayla, gave birth to her 3rd baby boy. (she's a pretty private person or I would totally steal some photos of her adorable family off Facebook!) For the big event, her parents flew to Japan to join her and her family. I met Kayla's mom, at a BBQ last weekend and found out she was an author. As you all know I love to read so I began drilling her with questions. Turns out she writes in a genre that I do a lot of reading in, military suspense. If I'm going to read a novel it's going to be some sort of suspense. She was kind enough to send me a digital copy of her book, The Pact, which I wasted no time diving into. Commander Celia Kelly is a perceptive Naval Intelligence Officer rebuilding her life after the tragic loss of her husband. The suspicious suicide of a fellow Officer has Celia questioning the mission she’s been assigned. With the help of a one of a kind secretary, by the book assistant, and a Navy SEAL, Kelly discovers she’s been set up. Digging relentlessly, nothing is as it seems. Someone is after twenty million dollars that disappeared when Kelly’s husband went MIA and now that someone is after her! I have to admit, I was a little skeptical at first. I've read a few books by first time authors and was unimpressed each time. (I'm not 100% that this is her first book but it's the first book in a series so that's what I was thinking going into this). The Pact absolutely blew me away! I couldn't, and didn't, put it down until I was finished. Mrs. Bring did a great job at developing her characters in a way that I was able to connect with instantly. The plot grabbed my attention immediately which was nice, I hate when it takes me 10 chapters to really get interested in a book. The story line was well thought out and easy to follow. (I found myself wondering how she kept track of it all while writing. I would have had to have color coded post it notes EVERYWHERE.) One of my favorite parts of this book was how easily the main character, Celia, talked about, explained and defended her faith. It wasn't a huge part of the story but it's something that stuck out to me (probably because that is something that I struggle with in my own life). I've rambled on long enough for someone who isn't a book critic. Let me just say that I can't wait for the next book, The Lie, to come out next week! 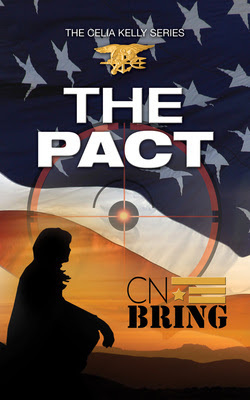 Mrs. Bring is huge supporter of the military and their families and she has donated a signed copy of The Pact for me to give away to one of you awesome ladies (or guys if there are any males reading this). If you'd like to win a copy of the book, just leave a comment letting me know what you're reading now (or if you're not, what you'd like to be reading now). Good luck and if you don't win, this book is definitely worth the Kindle price! I was given a free copy of the book but I was not paid for this post and all opinions are my own. Entries will be accepted until midnight EST on 31 July 2013. I'm not reading anything right now - I have a week left of school and then am really looking forward to some "me" time! This sounds super intriguing! I'm ashamed to say that my life has been dominated by Netflix lately...I really need a read! Does reading Panda Bear, Panda Bear a thousand times a day to my daughter count?? I'm actually not reading anything right now,a s I just finished The Light Between Oceans by ML Stedman (I'd give it a 3.5/5, just because the lack of communication between the characters drove me up the wall).